From the author of the international bestseller The 100-Year-Old-Man Who Climbed Out the Window and Disappeared, a brilliant satirical novel set in modern Sweden—a story of idealism and fanaticism, gangsters and entrepreneurs, sensationalism and spirituality, that explores the values that matter in contemporary life. In a former brothel turned low-rent hotel, the lives of three unusual strangers—a former female priest, recently fired from her church; the ruined grandson of an ex-millionaire working as a receptionist; and Killer-Anders, a murderer newly released from prison—accidently collide with darkly hilarious results. Seeing a lucrative opportunity in Killer-Anders, the unlikely trio form an unusual new business. The Priest and The Receptionist will handle strategy and public relations, and coordinate Killer-Anders’ “missions.” Using the media’s obsessive need for sensational, headline-making stories to advertise their talent’s superb “skill,” they quickly build a clientele of rich Swedish gangsters. Suddenly, they’re making an altogether different kind of killing of their own. But when Killer-Anders begins asking deeper questions about purpose and meaning, his curiosity leads him to an unexpected discovery: he finds Jesus. Desperate to save the money machine they’ve built, The Priest and The Receptionist devise an audacious plan utilizing Killer-Anders’ newfound and decidedly fervent faith. 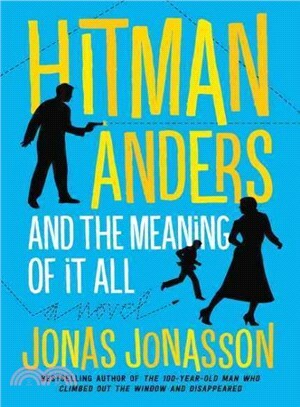 Mischievous yet big-hearted, filled with Jonas Jonasson’s trenchant humor and delightful twists,Hitman Anders and the Meaning of It All is a delightful comic adventure that reminds us it’s never to late to start over—and to discover what truly matters.